Ready for a shocking statistic? A mere 13 per cent of customers claim to be loyalists to a particular company, according to recent research from McKinsey & Company. As convenient as it would be for your entire customer base to stay true to your brand without external incentives, that isn’t today’s reality. Consumers want perks, discounts and special treatment in exchange for their undying loyalty – and maintaining this customer loyalty doesn't come cheap for companies. As you undoubtedly know, nothing in business these days escapes the scrutiny of CEOs, CFOs and others answerable to boards and shareholders. With the increasingly competitive global business market has come greater accountability and an obsessive focus on margins, bottom line profitability and cost reduction - it seems every single thing needs to justify its own existence. Loyalty programmes are one area of business receiving more attention than ever, and it appears there is a growing crisis of confidence around both the value they deliver and the expense of running them. What value do we get from loyalty? Do we even need a loyalty programme? What would our customers or clients say if we reduced the benefits? If we tweaked ‘X’, what is the likely bottom line impact on margin and costs? The problem here is that most businesses are not equipped with the expertise or the tools for using data to unpick the relationship between the loyalty programme and customer behaviour. As a result, loyalty programme reviews typically only scratch the surface. Why? Because they are based around superficial metrics. Gaining a clearer understanding of how well a programme is working, how people are engaging with it and the benefits it delivers requires companies to suit up and take a much deeper dive into the data. 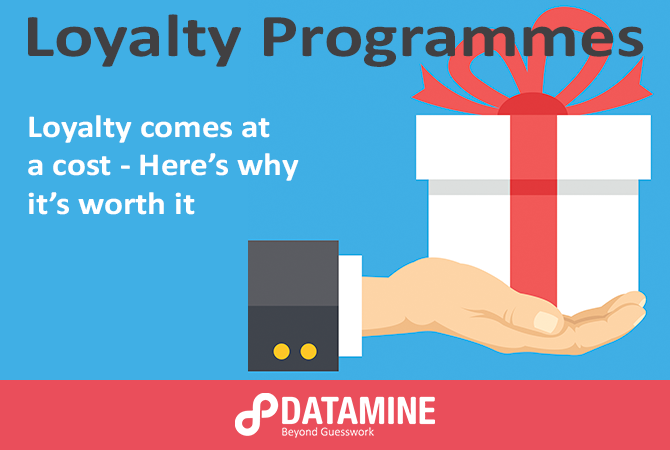 At Datamine, we advocate an ongoing monitoring process involving a clear set of steps for gaining a deeper understanding of your loyalty programme – particularly with regards to its effectiveness and what it’s really costing you. There’s nothing like real customer insight for providing an understanding of how consumers feel about your loyalty programme and the ways they are engaging with it. With that said, it’s important to keep in mind that this type of qualitative research is not a substitute for data analysis; it should instead be viewed as a complementary activity that can deliver nuggets of informational gold about your customers that quantitative analysis never will. It’s also wise to keep in mind that, when prompted, customers might make unsubstantiated claims that they’d act in a certain way with regards to changes in a loyalty programme, e.g. “Take away this perk and I’ll stop buying” or “Add this incentive and I’ll purchase even more”. The only way to ascertain the validity of these answers in customer experience surveys is by looking at the actual data – data doesn’t lie, and it might say something different about customer behaviour than the customers themselves. Guide the inner workings of your loyalty programme and provide direction for financial modelling to settle on a model that works for customers, your business and suppliers. Check out this resource page to read more about the different types of analytical modelling and their marketing uses. By implementing an action plan and engaging the right tools for analysis, marketers will find the answers they need for quantifying the value of a loyalty programme, identifying areas in need of change and reducing the risks in making such changes. When provided with a better understanding of the measurable benefits associated with the cost, senior management tends to become less fixated on the bottom line cost of loyalty programmes. And, equipped with this arsenal of analytics tools, marketers will be well-armed for any inquisition into loyalty programmes that comes their way. Postie+ launched a loyalty programme in April 2016 – a year in, they decided to re-evaluate the fiscal viability of the programme in order to make any necessary adjustments but maintain high customer satisfaction. Having worked with Datamine before and been impressed by our expertise, the Head of Marketing & E-Commerce at Postie+ approached us about getting external help in evaluating the effectiveness of their loyalty programme. Their biggest concern was identifying and altering problem areas in the loyalty programme while not disincentivising high value customers from driving spend across the store network. Datamine used data analysis, financial modelling and customer surveys to analyse the effectiveness of each branch of the Postie+ loyalty programme. Fusing qualitative research and data analytics gave us a rounded picture of customer behaviour and perception – the data shows how people are spending, but it’s important to balance that with customer perceptions of the value offered by the programme. After picking apart the relationship between customer behaviour and profitability, we identified some distortions in the loyalty programme. The way customers were using the programme meant that the highest-spending and longest-term customers weren’t always getting rewarded proportionately for their value. At the same time, there were other customers that were earning rewards passively without spending enough to make it profitable for the business. Through this analysis and financial modelling, Datamine found a couple levers Postie+ can pull that will massively affect cost, yet continue to deliver value to customers (particularly the high value ones). We delivered Postie+ the insights needed to make certain changes within the programme so that the perceived value of the programme remains high but the underlying cost is minimised – a number of the recommended changes will have been implemented by the end of 2018.